Although, this was originally called a "high frequency transmitter" in the Millen ads it is by all current standards an HF & VHF transmitter. Primarily this transmitter was designed to allow operation up through 2 meters, it came offered with plug-in coil assemblies for 20, 10-11, 6 and 2 meters. The transmitter is crystal controlled and uses a commerically available Bliley CCO type oscillator assembly. A 2E26 is used as a driver/multiplier tube and the final amplifier was a 829B. The 829B was actually part of an amplifier assembly which Millen sold separately with the product number 90811. A separate power supply is required for the transmitter. Fully operational it is rated at 75 watts output without forced air cooling. 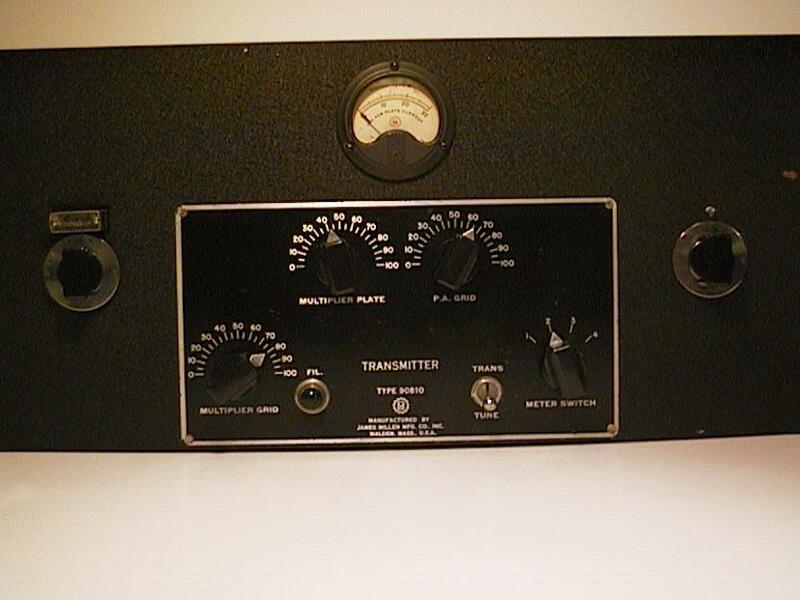 This transmitter appeared on the seen in the late 40's. However, in the 1952 ARRL Handbook this product was distinctively marked with a red lettered DISCONTINUED across it. My quess was it lacked the necessary TVI (Television Interference) protection. The above chassis RF decks are not RF shielded!